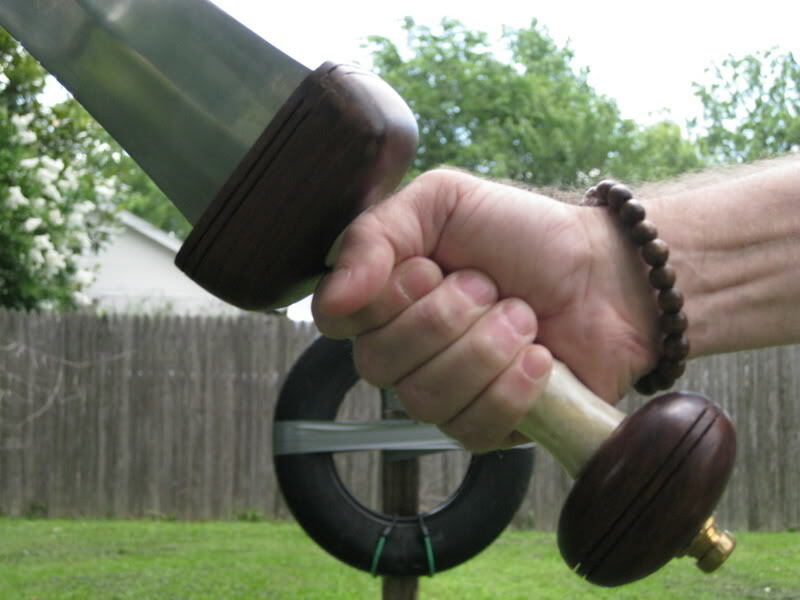 Forum Index > Historical Arms Talk > Entry Level Gladius advice - Deepeeka any good? Posted: Tue 21 Feb, 2017 11:50 am Post subject: Entry Level Gladius advice - Deepeeka any good? I may be tempted by one of those. As far as swords are concerned, I'd never consider Deepeeka - the shortcomings are plain for me to see. That said, roman weaponry is not my usual area of interest and I know Deepeeka is well used among roman reenactors. From afar, these look the part, with glorious scabbards and are rock bottom price. Anyway - any feedback on the quality, handling and historical accuracy of these? I've looked around, seen dismounted pieces with very thin and narrow tangs, fittings that may be slightly over sized, heard about soft blades. But read that Deepeeka had steadily improved - but if the "primus" line is the result I'm not convinced (judging by the handful of swords that came out of it). You might want to check out this. If Matthew Amt doesn't notice & chime in within a few days you might try a pm to him. If you get one do you plan to improve it? Not sure if I want to take on a project of this nature. If I was to, I'd go for the best blade I can find and work from there (which would be an albion mainz blank). Hi Julian, there was a fantastic thread on the romanarmy forum where you had the owner of Deepeka going through all of his designs and taking on all of the feedback from the experts there. The prototypes looked fantastic but I have no idea on how to actually find them in the wild. Hey William, sounds great - would you have a link? But I read on their mainz model page: "Weapon is made of sharpenable mild steel"
You will have to make an account to view the thread. Yup, I'm here! Saw the post a couple days ago, but I've been out of the loop on Roman stuff for a while, and haven't actually seen most of these Deepeeka pieces in person. So I'm not sure how much good information I can give! I've got one of the old 4209 Mainz swords myself. The hilt parts seem a little off in shape, and the grip is usually too long. I rather like the blade profile, BUT I have noticed that they vary quite a bit in weight and balance! The scabbard can be rather huge, and the decoration is pretty cheesy, not rich and full like the originals. The 2007 Fulham and 2008 Tiberius look good to me. Definitely nice scabbards! Good blade shapes, decent hilts overall. The fluted pommel and guard on the Fulham are rather over-used, but a couple originals do exist. The simpler horizontal lines or ribs on the Tiberius are much more common. I really don't like the blade profile on the 4209A "Legionary Mainz". It reminds me a lot of the horrible thing MRL came up with many years ago, basically just their Pompeii with some grinding. The waisting is just way too long and the whole shape is yucky. Nice scabbard! As far as blade quality goes, I honestly don't know! It's probably a step above "mild" steel, but I simply haven't worked with enough *good* swords or steels of known alloys to be able to tell. I have generally just assumed that these are at least as good as the government-issue junk the legionaries were using 2000 years ago! Certainly I've seen photos and drawings of original swords with scary-thin tangs and the like (including asymmetrical edges, crooked points, etc.). The weight and balance will probably vary. I agree that hilt parts are very difficult to size properly. It's very common for Indian grips to be too long, for starters, though they're getting better on that. (*Deepeeka* is, at least!) But just seeing photos of originals in cases, or even having "scale drawings"--very small drawings--in various books can easily result in hilt pieces that are still too big. I've never been able to examine originals in person, beyond snapping a few photos back in the 1980s. So I've gotten used to Deepeeka hilts and don't really see them as horribly massive. Are they? Dunno! One frustrating thing is that Deepeeka seems to add new items without really revising or dropping their old ones! So you can still get the older models with all the flaws, and the way they do catalog numbers means that it's very easy for a vendor to send you the wrong thing. Many customers won't even notice the error. Oh, fair warning--Soul of the Warrior is not always the best place to do business with. Rusty is a great guy, and will NEVER rip you off intentionally. But he's just not the ace businessman and it can be VERY hard to get anything from him that isn't in stock. And you might not *know* it's in stock or not when you order... My advice, if you see him at an event with a tent full of stuff to sell, buy what you like. And yes, my poor website is in dire need of an update! I've been cut off from it for a while, and have to rattle the webmeister's cage to reset my password and such. Even then, a massive update is not likely, since I put most of my attention on Greek stuff these days. But I'll try to fix the worst problems at least! 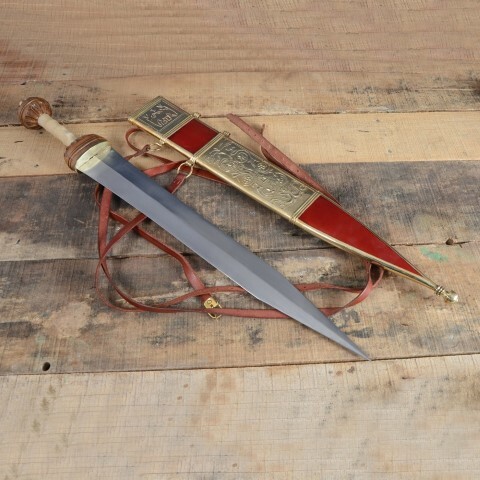 Bottom line, Deepeeka is aimed at people who can't make stuff themselves, and need a reasonably historically accurate gladius (or whatever) right out of the box. For them, this is heaven. For many of us "more advanced" folks, if you're looking for a GOOD blade, especially for a DIY project, Deepeeka may not be the best place to shop. The more I look at the Deepeeka models, the more I notice some serious (if not spectacular) grinding irregularities. Chances are, I won't be impressed with these once I have one close. Scabbards are really great looking though, and I can imagine tweaking some of these fitting to something much better - but I'd have to be content with the blade such as it is. But both implies a another lengthy DIY project...while I was looking at the easy road for once. Valiant and Hanwei also made one, but sporting hispaniensis-ish type blades which I'm not very fond of. I'll keep digging but suggestions welcome! 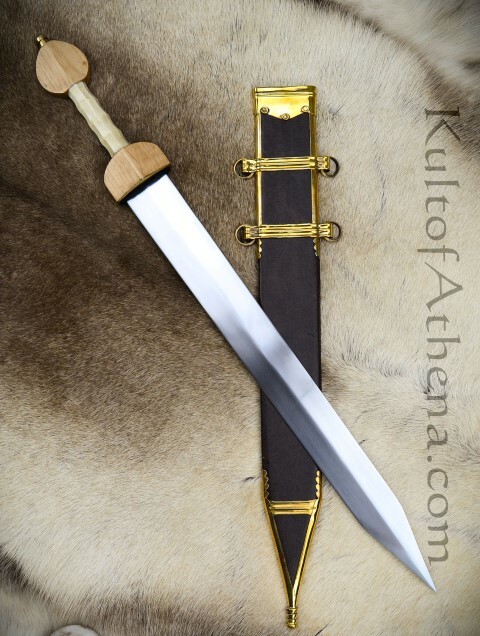 I just ordered the AH2007 Fulham Gladius (bottom pic, with red scabbard) at a great price from a european Deepeeka reseller (same price as KoA in fact even slightly less). 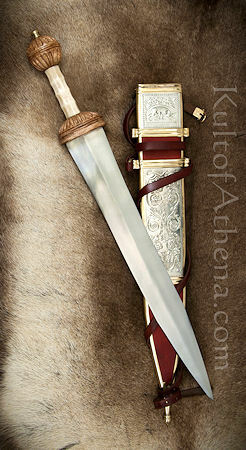 I chose this one mostly because the scabbard is rather magnificent (even including buckles and veg tan straps). The guard features a brass plate is nicely recessed in the guard, a bone grip that looks decently made. I dislike the pommel, finding the shape slightly off and will likely change it. This is only wood after all...I'm too accustomed to overthinking things because they usually involve hours of metal filling. I may also get lucky on the blade - who knows! I think this is a great kit and I hope I'm right. 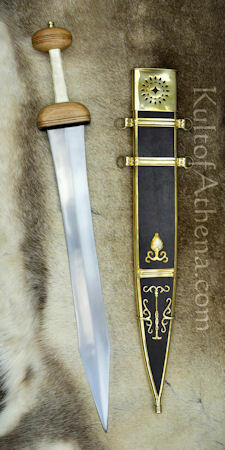 For half the price I was hesitating with the AH2010 Fulham Gladius (first pic below with black scabbard). Blade and hilt had simple and clean angled lines that would have been easy to thin down, refine etc,...but the scabbard was not as attractive...and I have to say the mainz blade is really the form I am after. Anyway - rather excited by this purchase - this reminds me of my first "upgrades" projects on MRL pieces. It will most likely serve as training to fit an Albion blank at a later stage - that is, if I happen to like gladii once introduced to one up close. I will document one also one of these days, to check the correct size of such beasts.